Damnation Festival 2012: Complete Line-up. So here it is. The full lineup poster for this years Damnation Festival to be held at Leeds University, UK on the 3rd November. Eyesore Merch are proud sponsors of the 3rd stage so be sure to check out some of the bands on the day! By the time that Faith No More released their album Angel Dust just over a week after my 14th birthday, I was already a big fan. After watching ‘From Out Of Nowhere’ from the previous record on the long defunct ‘Chart Show’ on ITV in 1990 I went straight out and bought it with my paper round money. Little did I know at the time that The Real Thing was their third album and that the band had gone through many line-up changes since their inception in 1981. A whole succession of vocalists had come and gone – even a brief stint by none other than Courtney Love in the very early days. Chuck Moseley had been the singer (if you can call it singing) for the first two records; 1985’s We Care A Lot and Introduce Yourself from 1987, but he was eventually ousted due to his very erratic behaviour and replaced by Mike Patton who was then gigging with his high-school band Mr Bungle. Despite including songs titles such as ‘Surprise, You’re Dead’ and ‘Zombie Eaters’, The Real Thing was very much a lightweight version of Faith No More’s sound – sounding somewhat rushed in places, mainly due to Mike Patton having to write all of the lyrics in the space of a fortnight before recording started. Their much heavier sound came to the fore with 1992’s Angel Dust. The first thing that strikes you when the album begins is Patton’s voice. If you had heard the previous record then you could be forgiven for thinking that the band had decided to ditch another vocalist. But this wasn’t the case, Patton had re-invented himself (as he has numerous times since) and the days of bicycle short-wearing tomfoolery were over; his voice seemed to have dropped for a second time in between records. What Angel Dust provides the listener with is something that the band hadn’t managed to do before or have done since – a collection of near-faultless songs which never stray into novelty territory. OK, ‘RV’ does tend to come very close to the novelty line but I’ll give it the benefit of the doubt. ‘Land of Sunshine’ – Like I say, this is where Patton’s vocals come into their own, and this also features an awesome bass line from Billy Gould. The brilliant chorus manages to sound like some kind of ghoulish fun fair with Roddy Bottum’s eerie keyboard riff and Patton’s layered laughing vocal in the background. ‘Caffeine’ – One of the best songs on the record and where guitarist Jim Martin’s filthy guitar sound really comes good. Always excellent live and brings back memories of a classic performance on MTV where the band refused to let the presenters speak once they’d finished; instead deciding the scream and thrash around for another 30 seconds or so. ‘Mid Life Crisis’ – Released a couple of weeks before the album, this song (and accompanying video) are the perfect introduction to the record as a whole. Patton’s vocals change from the guttural in the verse to something a little more reminiscent of the previous album. Watching Patton being almost pulled apart by horses in the video is a little unnerving, but that only acts as a reference of some of the material to come. ‘RV’- …. And so we come to ‘RV’. If there is one song on the album that could be classed as novelty then it’s this one. It’s a great song in itself however, with Patton playing a lazy bum no doubt sat in the ‘recreational vehicle’ of the title whilst the band play a little bluesy-country type number in the background before rocking out for the middle eight. ‘Smaller and Smaller’ – This one is a straight-down-the-line rock song. Towering guitars and powerful vocals. The only difference is that Faith No More, not wanting to be outdone in the weird stakes, decide to include a funky middle eight with some middle-eastern chanting. As you do. ‘Everything’s Ruined’ – This is one of the more accessible songs on the record without actually being too poppy (despite the incredibly lame, low-budget green screen video). Roddy’s keyboards are used to good effect and aren’t buried under layers of guitar like they tend to be in much of the rest of the album. ‘Malpractice’ – Ouch. This one is pretty heavy and no doubt one of Jim’s favourites as his guitar is dirtier than a rainy weekend in Glastonbury. Again, they confound what we should expect by introducing a mini dream sequence followed by a sample of some strings from Shostakovich half way through. Patton screams his way through this four minute monolith like there’s no tomorrow. ‘Kindergarten’ – The weakest song on the album, musically and lyrically but still listenable. But sadly, if there was a 12-song limit on albums I fear this would be the one to make way on Angel Dust. Lazily written and the band just don’t sound like they want to be there. ‘Be Aggressive’ – Which is why we have this song to thank as being the one you can skip to. This is a fun track – typical FNM funk-rock with Roddy’s keys high in the mix once again. Plus of course the ‘chorus’ of school kids spelling out the words ‘B-E-A-G-G-R-E-S-S-I-V-E’ is a moment to savour. ‘A Small Victory’ – Dark, brooding and accompanied by a video equally dark and brooding, centred seemingly around the First World War. A killer chorus and middle eight (which features Roddy’s take on air-raid sirens) make this one of the stand out tracks on the album. ‘Crack Hitler’ – Another reference to wartime here, but more of a reference to the drug. Not clear whether it is autobiographical of Patton’s drug use or not, but it’s still a powerful piece of spoken word, but Jim’s guitars getting a little bit of pedal treatment. ‘Jizzlobber’ – If there’s one thing that ‘Jizzlobber’ isn’t then that is subtle. In fact it’s about as subtle as being hit in the face with a house brick. The pleasant night time chirping of crickets is soon replaced with a Psycho style piano riff and some of the heaviest guitars you’ll hear outside of the death metal section of your local record store. Coming in at seven minutes, it is uncomfortable listening in the extreme, but you still won’t be able to stop yourself. ‘Midnight Cowboy’ – Probably better off ending with the heavenly organ of ‘Jizzlobber’ rather than with a cover version, but as cover versions go this isn’t bad – it isn’t great either, it’s pretty faithful of the John Barry original. So if you’ve not heard it before (and there’s a good chance you haven’t, it is 20 years old after all) then hopefully this retrospective might give you an idea what to expect! A big thanks to our guest contributor Ben from the great music blog Ben Likes Music. Yesterday (the 24th September) saw the release of ¡Uno! The latest album from Green Day; hot on the heels of the release is an album review by Erika one of our guest posters here on the Eyesore Merch blog. “¡Uno!” is the ninth studio album from Green Day, but it will be soon followed by a tenth and eleventh in a couple of months! Billie Joe Armstrong has explained this trilogy as the band just felt especially creative and sitting down in the studio the songs just kept coming so they decided to write them all and record them all. Green Day’s sound has changed over time, but there’s no such thing as “old” Green Day and “new” Green Day, there’s a band, there are three artists who grow up. It’s about the age, the adult life but it also is about artistically maturing. The last two studio albums from the band – American Idiot and 21st Century Breakdown, respectively – have officially created the world of pop punk and “¡Uno!” is definitely on its way to follow them. “Stay The Night” – might lyrically remind Gin Blossom’s Hey Jealousy. A simple every-age love song to dedicate. “Carpe Diem” – is the anthem of the entire album and probably the anthem to a whole generation of guys. It’s a catchy and an enjoyable track. “Kill The DJ” – the album’s second single, personally expresses what I always think every single time I’m in a club or at a party…a Funny, entertaining, amusing and humorous track. “Fell For You” – a special, straight forward love song everyone can relate to. “Loss Of Control” – kinda makes me think of what happened at iHeartRadio show, what about you? Such a great rock song. “Troublemaker” – Kinda repetitive chorus (maybe a radio-friendly song? Thought as a future single), but has the best solo on the album. “Angel Blue” – another great rocker and lyrically nice song. “Rusty James” – one of the strongest songs of the album, sounds like Loss of Control Carpe Diem. “¡Uno!” definitely is THE ALBUM of the year…at least of my year! I’m enjoying seeing an album from Green Day that isn’t a rock opera, (something different finally!) and I’m looking forward to the next two installments of the trilogy. The album is really amazing to me, edgy, high energy catchy songs that still say something without trying to teach you philosophy! I honestly can’t pick a “least favorite“, but I can say that Stay the Night, Carpe Diem, Let Yourself Go and Oh Love are the highlights for me. Bedroom Games: Show me yours and I’ll show you mine!! 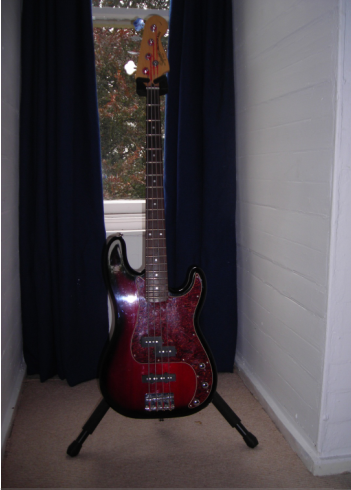 Tell us about your musical instruments and send us some photos. Which bands do you aspire to and which ones have you fantasised about sharing the stage with? Here’s number 1. It’s my Fender Korean Strat from 1989. It’s got a few dings but still plays great and the white finish has yellowed nicely to a finish appropriate for its age. I bought this new for £175. I hummed and hawed about the finish I wanted at the time but at the end of the day plumped for this. After all, if a white one was good enough for Jimi Hendrix, albeit in left handed format. Also, when I’m playing the right notes for once, I can shut my eyes and it morphs into a battered Sunburst and I’m suddenly the late lamented Rory Gallagher in his Blues rock heyday. There’ll be no “Messin with the Kid”! 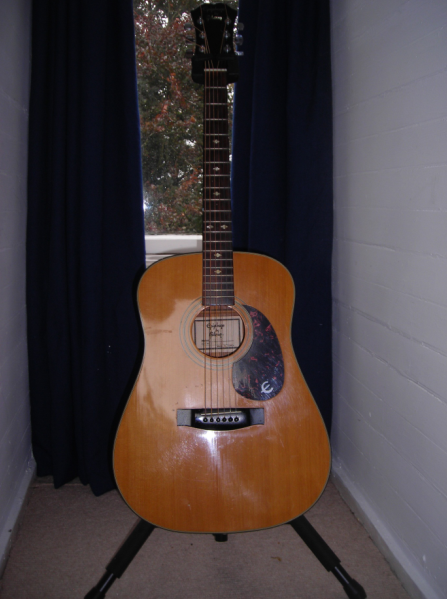 Next up is my 1988 Acoustic. It’s badged Epiphone by Gibson and has been an old faithful. It needs an appointment with an understanding luthier as it’s dropped a section of neck binding. It still sounds great on a new set of strings though and I love picking it up for five minutes then wondering where the last hour went. Does all sorts of stuff but Neill Young has been responsible for a lot of the chord progressions that it has endured. Now for number 3. 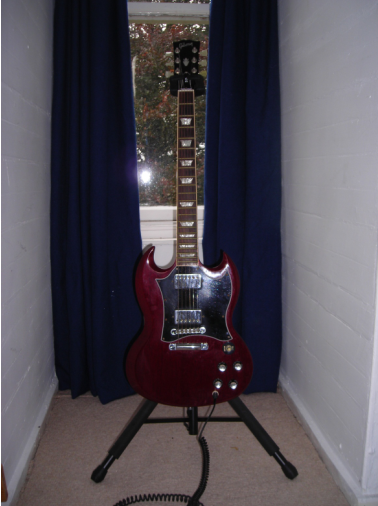 This is a 1996 Gibson SG. Someone I knew owed me some money at the turn of the century and we settled the debt with the SG. It’s humbucking good, it doesn’t get as much use as the stratovarious but when it comes out, it plugs into a tasty Marshall cabinet and the volume, as Spinal Tap says, goes up to 11. At eye closing time, I’m Robby Kreiger from the Doors or even on wilder excursions Angus Young from AC/DC. When it’s Black Sabbath time we can also do a feeble impersonation of Tony Iommi. It’s all good fun though. 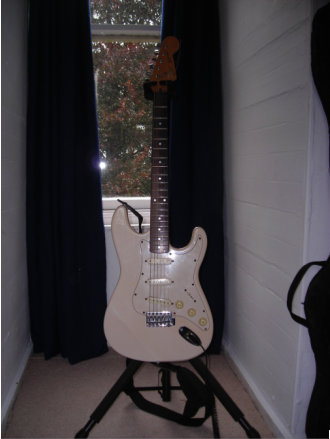 Here it is….needs a new set of strings. Hope you were moderately interested in the exposure of my deeper fantasies. This seems like a good site to air them. I’d like to see what other stringed treasures peeps have for their own amusement. Keep on Strummin……………. Yesterday we shared some brilliant photos of Bossk playing live at Nottingham’s Rock City club. The band are back impressing live audiences and here at Eyesore Merch we are looking forward to their live appearance at the Damnation Festival in Leeds where they will be playing on the Eyesore Merch sponsored stage! In further Bossk news we want to share with you a new track entitled “Pick Up Artist” that the band have made available to download for free from their website – click here to go download this awesome new track. Eyesore Merch have also got a new “Pick Up Artist” t-shirt design available to pre-order from our website; this adds to our already awesome Bossk t-shirt range that features limited edition t-shirt designs and a tote bag. It’s brilliant to see new material from the band as well as the live performance, both of which are getting us excited for a future new album! Friday night just passed was the first time we’ve seen Bossk live in over 3 years when they played Nottingham’s Rock City club as support to Torche. These guys have seriously stepped up their game! They totally blew the 150+ crowd away. Bossk are back and they mean business. I have been waiting for the full length release from Goat for some time now, Rocket Recordings released the Goatman 7″ single and we have been teased for a number of months with a cassette release (which I was too slow to pick up) and some uploads to YouTube. These releases gave a hint to what we could expect from Goat… the dark, voodoo feel of the music is often picked up on as is the afrobeat feel of the rhythms but what sets this music apart is how these grooves are alloyed with wild shrieks of awesome guitar work and chant-like, soulful vocals which often build up through the tracks dragging the music higher, the percussion making you dance faster and the lead guitar throwing you into some kind of pyschedelic trance when it cuts through the mix… then the track ends and you are left dazed, confused and ready to do it all over again. The attention to detail from Rocket Recordings is as high as usual and the orange vinyl is housed in a fantastic cut-out W M sleeve. Rocket Recordings produce stunning artwork and packaging that match the quality of the music they release; the end result is something to hold, treasure, play to friends and not forget about… a feeling that MP3s tend not to be able to match. Diarabi eases us into the world of Goat on side A but we quickly find ourselves hit by a quick one-two of psychedelic blasts via Goatman and the stand-out track from side A, Goathead. Goathead gently winds down before the organs of Disco Fever quickly pick up the groove once again. Side A ended with an organ line spiralling through the track and Let it Bleed on Side B sees horns enter the melting pot…The horns wail while the intensity of the chanting vocal line builds and then vanishes… voodoo ain’t forever! It’s hard to pin point a single track, what Goat have done is create an album that flows from the start to finish, and with vinyl you get that wonderful moment where side A ends the needle runs into the groove, you lift and flip the sweet piece of orange vinyl and drop the needle for another side of pyschedelic jams. This isn’t the sound of the paisley underground, this is the sound of a heavy psychedelic jugganaut that has been injected with a primal dose of voodoo… the rhythms are fast, complex and swing with a mean groove – and over the voodoo magic of the rhythm unit washes the soulful voice and searing blasts of guitar… if the rhythms are of the earth then the vocals and guitar are straight out of the aether… hunt this down and worship at the primal altar of Goat.